Inflammation is a hot topic. There are two different types of inflammation. The surface kind you can feel (i.e. heat, swelling, or pain associated with an injury, etc.) and the cellular kind that you don’t necessarily know is there (aka the scary kind that can lead to heart disease, diabetes, cancer, and more). If you know anything about inflammation, you have probably heard the word turmeric mentioned in the same sentence more than once. That's in part because of all of it's amazing nutritional benefits including high levels of iron, manganese, and some potassium and B6. However, the most important inflammation fighting nutrient found in turmeric, is curcumin. And for good reason! Curcumin is a compound with very strong antioxidant and anti-inflammatory properties, believed to majorly reduce your risk for cancer and Alzheimer's disease. Some other conditions thought to be helped by turmeric are arthritis, diabetes, cystic fibrosis, heart disease, and high cholesterol levels. When it comes to the best way to get your daily dose of turmeric, there are many ways to enjoy this anti-inflammatory powerhouse. 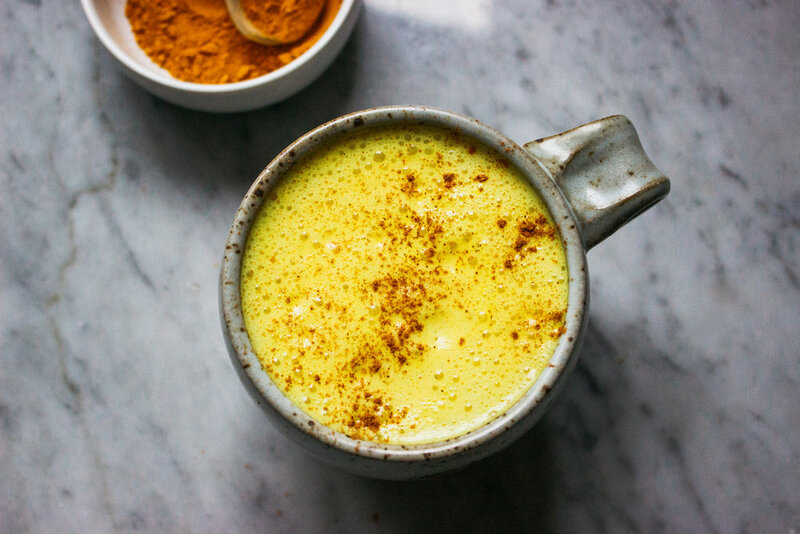 I like to sprinkle turmeric on avocado toast, salads and nourish bowls, in soups and smoothies, as a supplement, or as the star of this Turmeric Mylk Latte! This superfood latte is what I turn to when I am feeling a little under the weather, have any aches or pains, or just want something to help me wind down in the evenings that is warming and a tad bit sweet. Place all of the ingredients, except for dates, in a small sauce pan and whisk together over medium-low heat. Let simmer for 10 minutes, then place in a blender with dates and blend until combined with a nice creamy and frothy consistency. Pour contents into mug and top with a dash of cinnamon! *You’ll notice that black pepper is listed as one of the ingredients above, which you may or may not find interesting. The reason for its addition is because black pepper actually helps the body to better absorb the curcumin found in turmeric along with its amazing benefits.